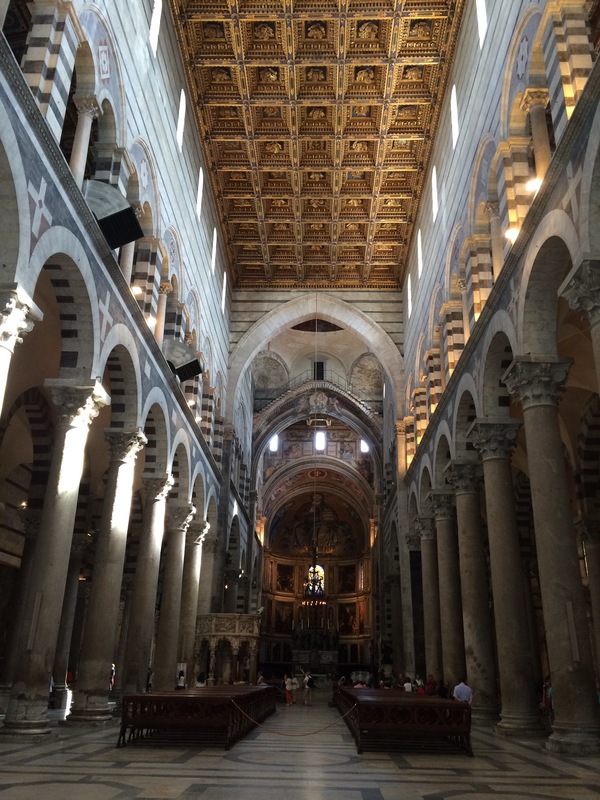 This is Part 2 of our visit to Pisa. For Part 1 and more about the city please click here. 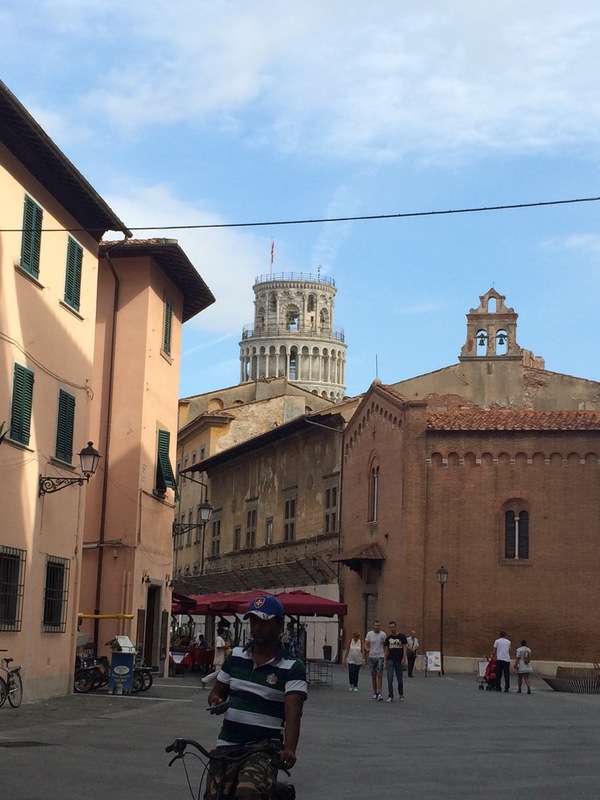 Besides the food, the reason to go to Pisa is to see the Leaning Tower of Pisa. It’s one of those things that every single person in the world has heard of and seen in books, magazines, and movies. I was prepared to be disappointed. Nothing that famous can possibly live up to all the hype, right? I was so very not disappointed. The first thing to notice is how white it is. It is blindingly white. 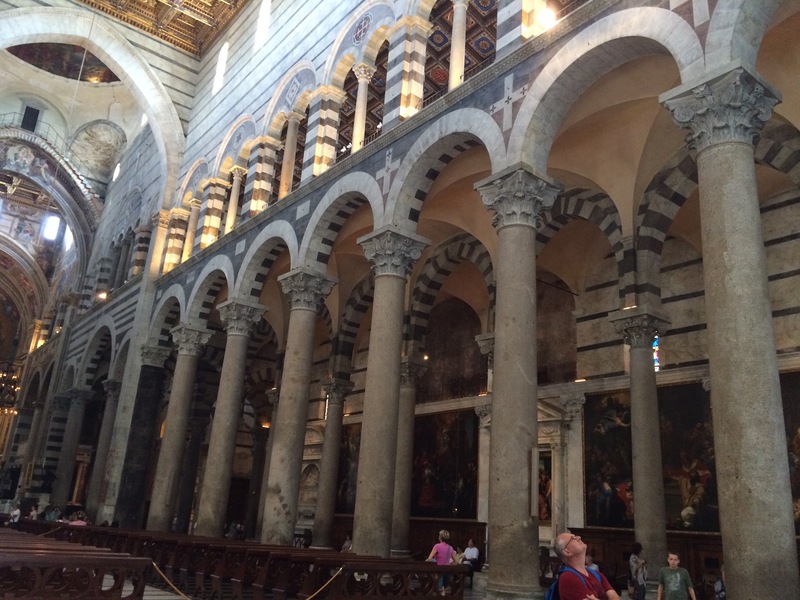 Actually, the entire square of the Piazza dei Miracoli is the white of bleached bones. It’s a startling change from the Tuscan yellows, greys, and browns of the buildings and streets leading up to the square. It’s even more amazing when they are framed by bright blue skies. The Tower is deceptively hard to photograph. Your brain really wants it to be straight so you find yourself tilting to make it show up straight in the photo. Plus it is TALL. It’s 30 meters tall, so if you want a good picture of yourself trying to hold the Leaning Tower of Pisa you have to back up a good long ways and dodge other tourist trying to do the same thing. You can visit the top of the Tower now. It was closed for a couple years as the building and preservation committee held debates and made plans on how to stabilize everything. But now it’s all open, for only 18 Euros per person. Well, it’s open if you are over the age of 8. 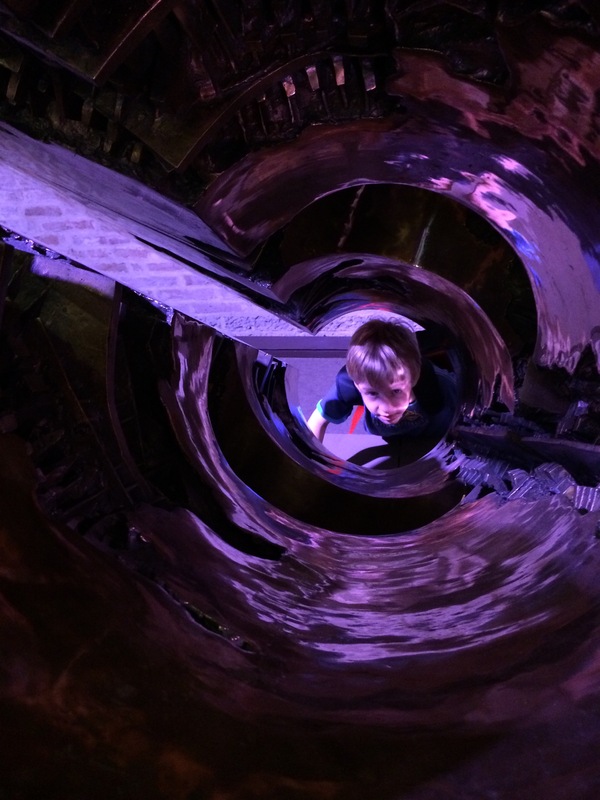 The Powers That Be are so concerned about the angle of the tower, the number and height of the stairs, and lack of OSHA approved safety equipment that they have forbidden anyone under the age of 8 from being in the Tower. And if you are over the age of 8 and under the age of 12 you must hold an adult’s hand, which I’m sure Tweens everywhere just love. If you are under 18 you still have to have an adult with you, even if they are your horribly uncool parents. The Cathedral with the Tower behind it. 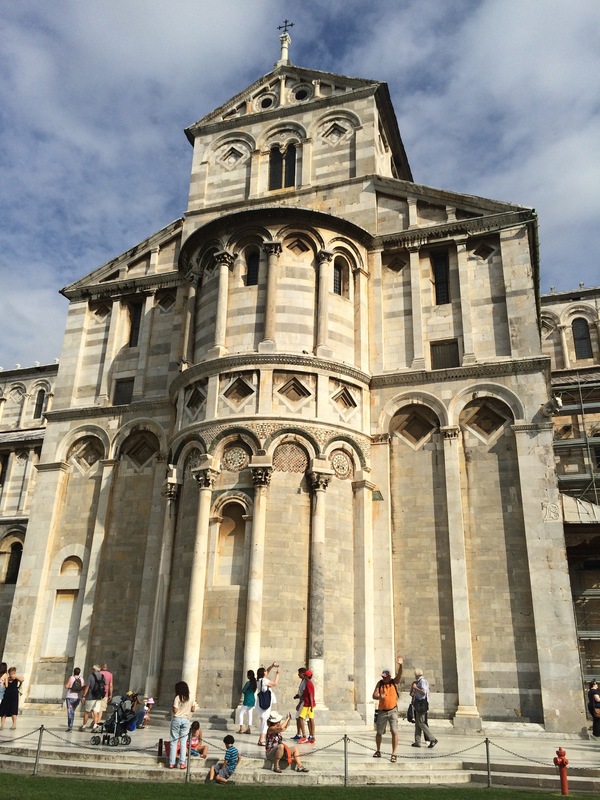 Next to the Tower is the Pisa Cathedral, also known as the Duomo. It dominates the plaza. In fact, this used to be known as Piazza del Duomo before the name was changed. It is a huge church with 5 naves. And it is OLD. They started construction in 1064! 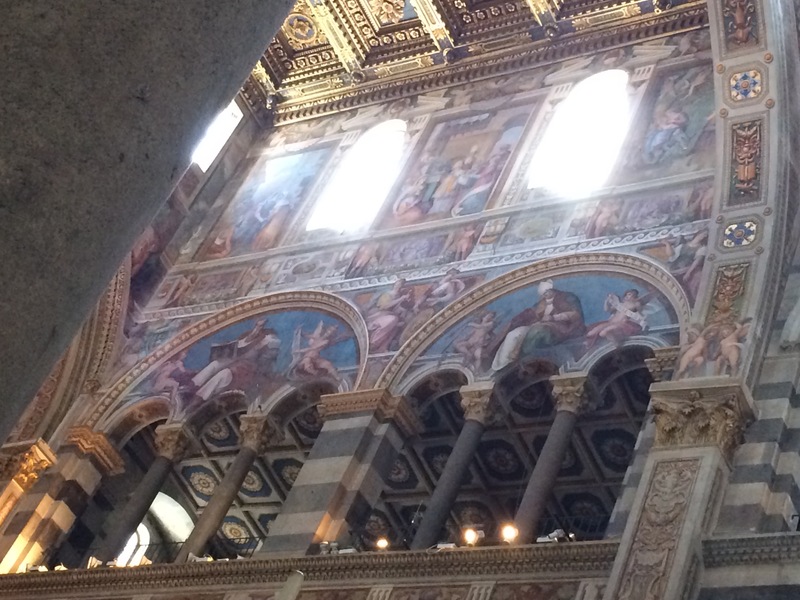 The architecture is supposed to be in the Romanesque style, but as you will see from the interior, it feels very Byzantine. The side of the Cathedral. Very majestic. The front entrance. The doors a brass and made by Giambologna. Beautiful mosaics over the entrances to the Cathedral. 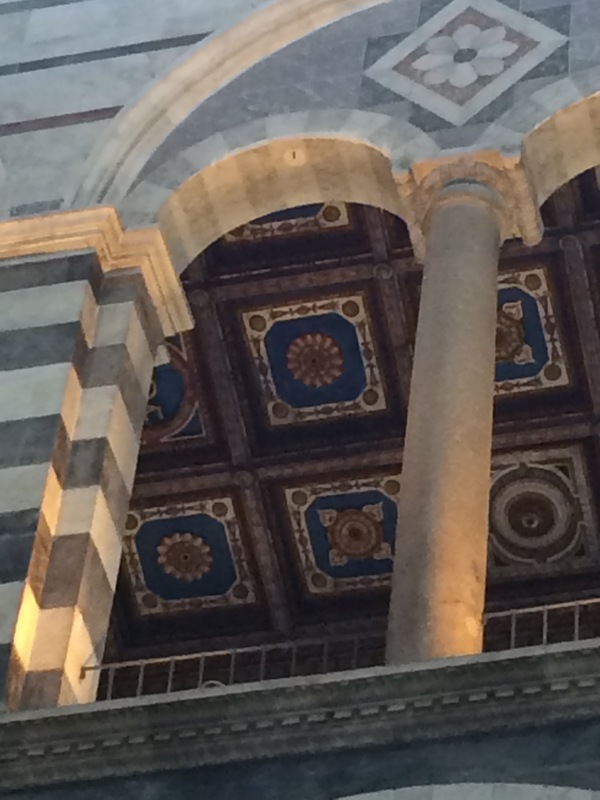 These are the first hint of the Byzantine influence on the architecture. The main interior of the Cathedral. 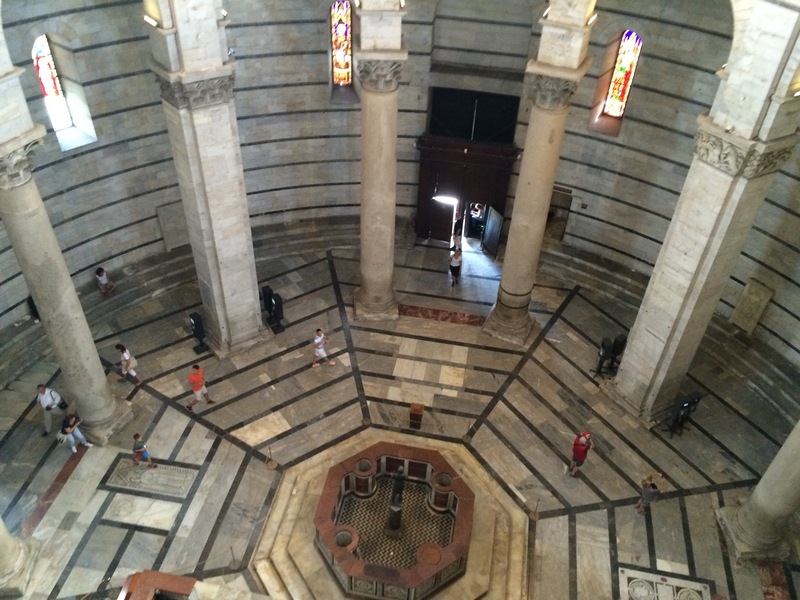 The marble interior has some amazing acoustics for two boys who like to hear themselves makes noise. There is a lot of detail in the marble. Note the striping and use of the natural color to make patterns. 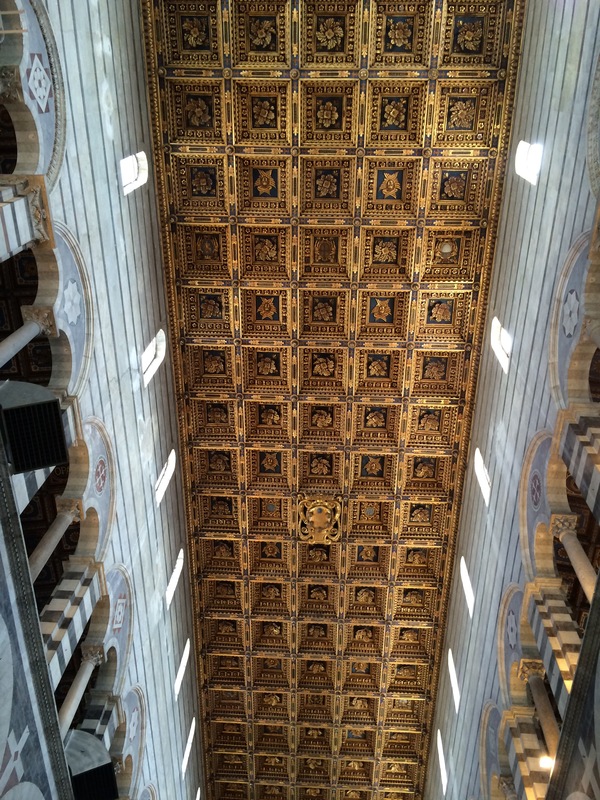 Every bit of the Cathedral’s design has been agonized over. And then there was a fire in the 1590s that destroyed the ceiling, the doors, and other interior decoration so they redecorate! The fire gave the builders and the community a chance to add other details and feature the art of the time. It was almost beneficial that this happened during the Renaissance, after all, this was in Italy, arguably the focal point of the Renaissance. 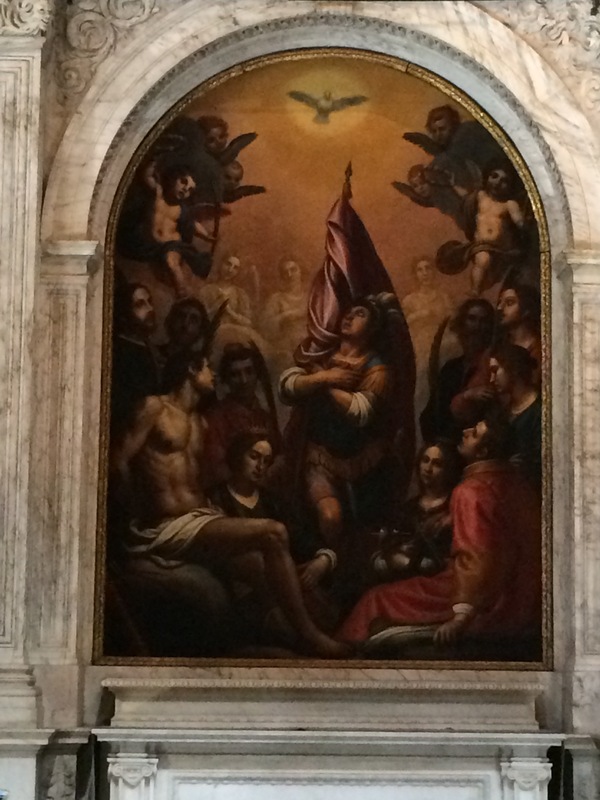 The church was able to recruit works from some of the most noted Renaissance artists of the day. Plus the Medici family, big donors to the reconstruction effort, got to have part of their coat of arms put into ceiling. In gold. Because they are Medicis. One thing I mentioned to E to get him interested in the church as more than just yet another church on our ABC tour of Europe (besides all the amazing art) was this incense chandelier. 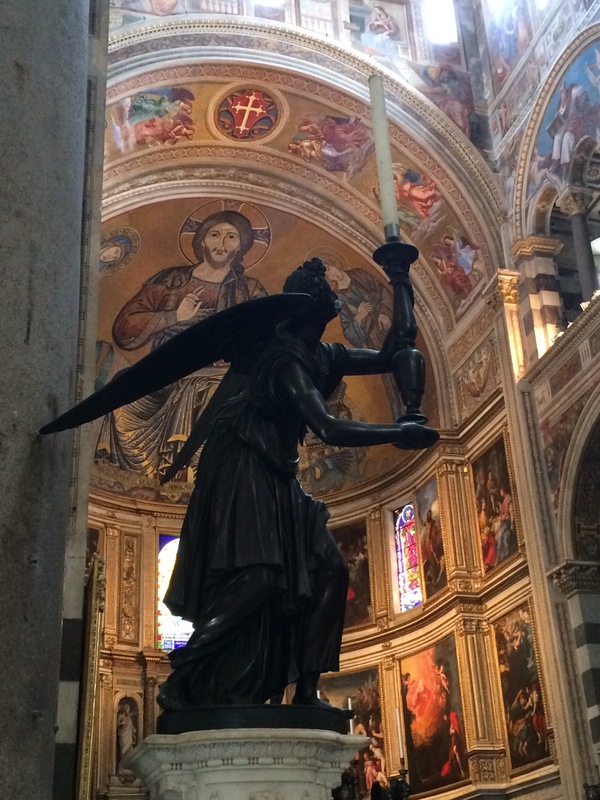 Legend has it that church services were a tad long and tedious for Galileo so he’d stare at things in the Cathedral, like the lamp (not this one – the original one is now hanging in the Camposanto). He stared at it sway back and forth for weeks and eventually developed his pendulum theory. That did get E to sit down and watch it for almost exactly 2 minutes before he started reading the book he’d brought along for just such an emergency. 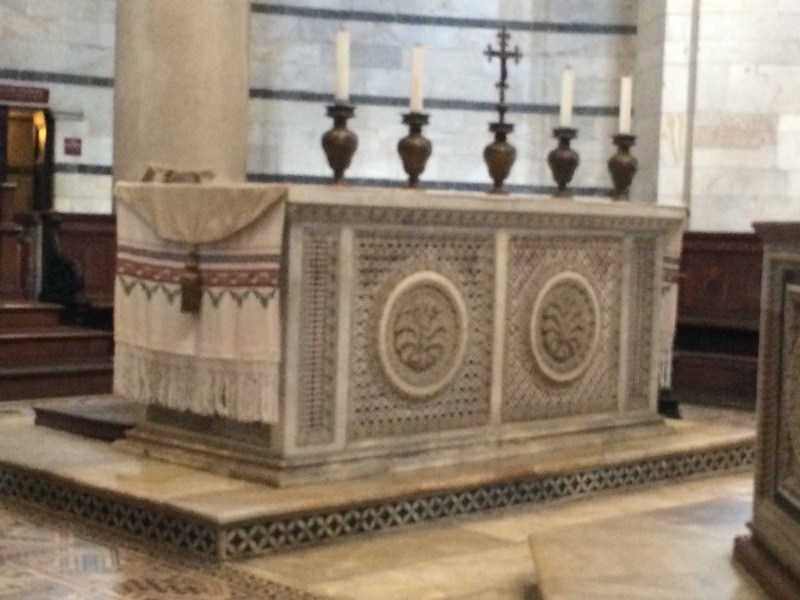 This the pulpit where the priest delivers the gospel. How can you not feel weird and intimidated to get up there and speak? Well, the boys wanted to climb it and have a look around. Thankfully the stairs are clearly roped off. 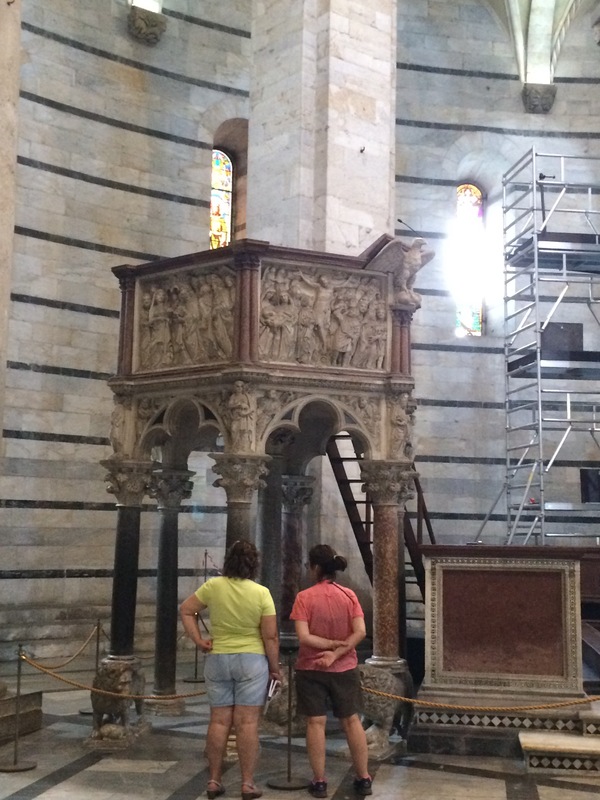 The pulpit is original to the church and it survived the 1595 fire. It’s not in the correct spot, however. It was packed away during the repairs and not found again until the 1920s. It was put up in a different, and arguably more prominent, spot shortly after it was found and cleaned. There are 9 intricately carved panels that arc around the top. Each panel is flanked by one of the prophets. 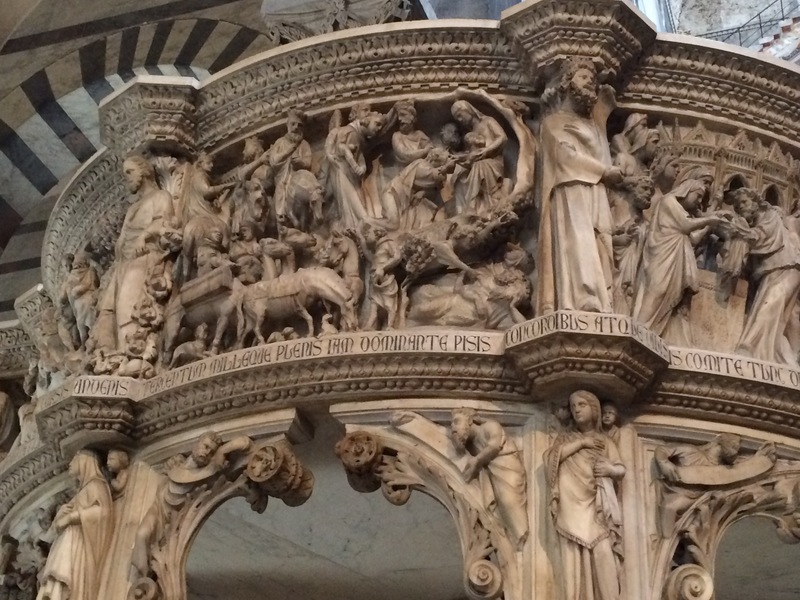 The panels tell the story about the Annunciation, the Massacre of the Innocents, the Nativity, the Adoration of the Magi, the Flight into Egypt, the Crucifixion, and two panels about the Last Judgement. 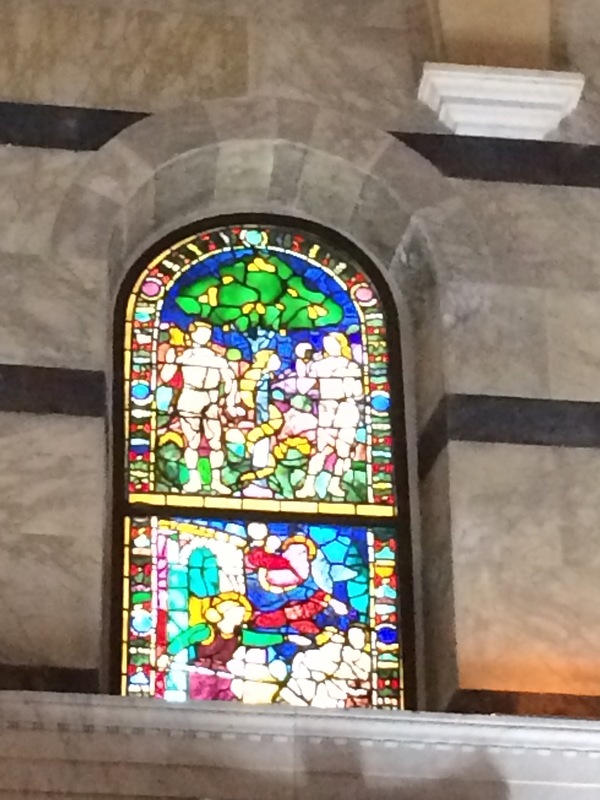 There isn’t much stained glass in the Cathedral. A fact that struck me as odd at the time. When I think of a Cathedral I think of rows upon rows of stained glass and a huge rosette dominating the back of the church with panels behind the altar framing images of Jesus and strategically lighting the priests and officiants. But here there are very, very few windows, yet there is plenty of light. What they do have loads of is art. Mosaics, paintings, wood inlay, carvings. Art is everywhere. I’ve been to many art museums in my life, but I don’t think I have ever seen so many pieces of Renaissance art in one place before. The paintings line the walls. There have to be about 20 of them all around the church. 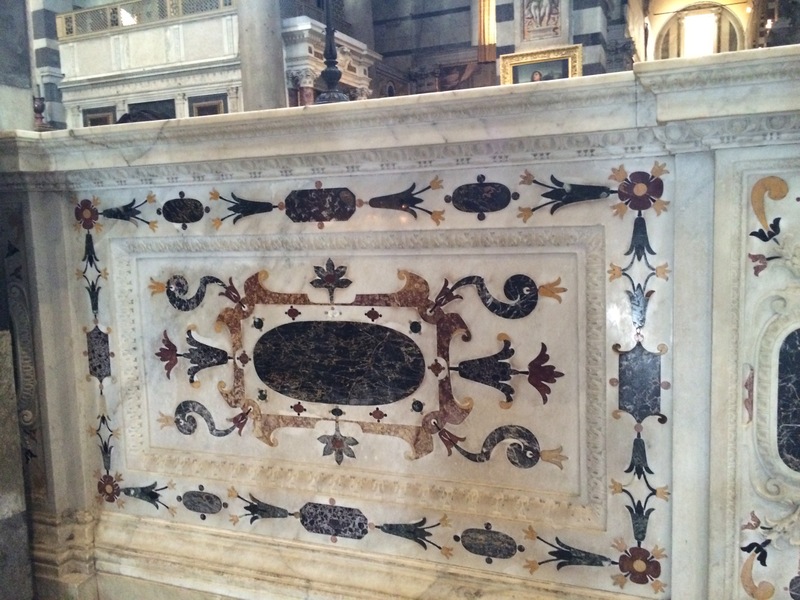 White marble with black marble and gold inlay and trim. It’s a wall that surrounds the altar area and helps to section off the main worship area from the side naves. These are all wooden mosaic pieces that line the walls under the paintings and above the bench that lines the walls. The boys were totally intrigued by these and kept walking back and forth looking at them. I was taken by the altar area of the Cathedral. 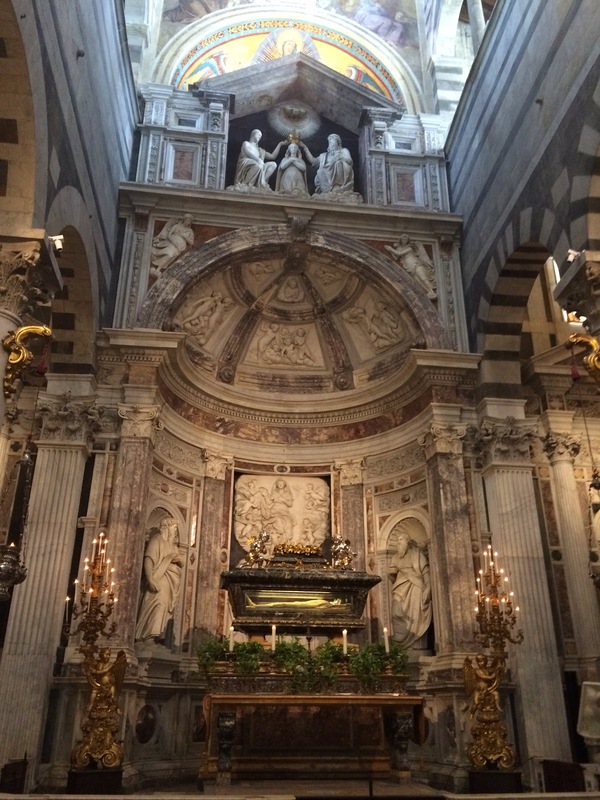 The walls surrounding the altar are painted by masters, but the space right behind it is a huge mosaic. 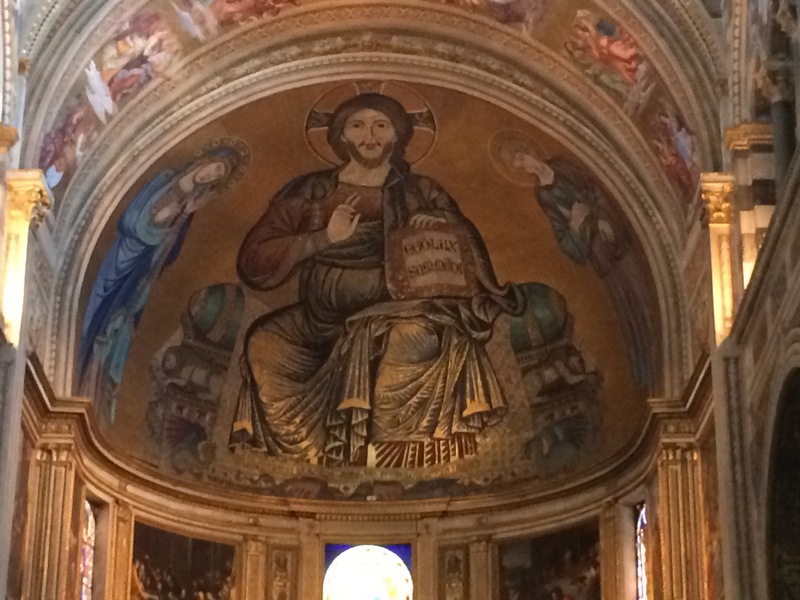 A close-up of “Christ in Majesty.” It is a mosaic of Jesus flanked by the Virgin Mary and John the Evangelist in the apse of the Cathedral. 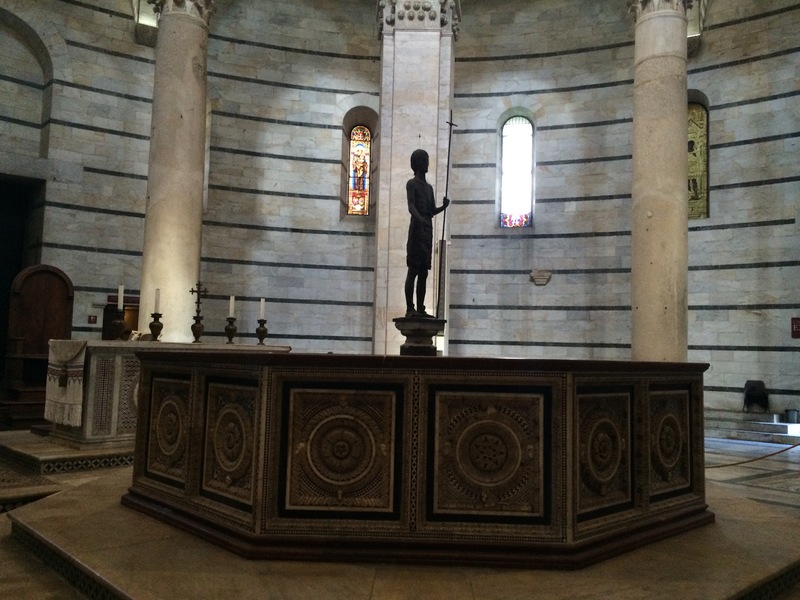 It original to the Cathedral and survived the fire. Every inch is painted with saints and angels, keeping an eye on the priests. You can see how they are just starting to embrace some modern pieces of art into the Cathedral. 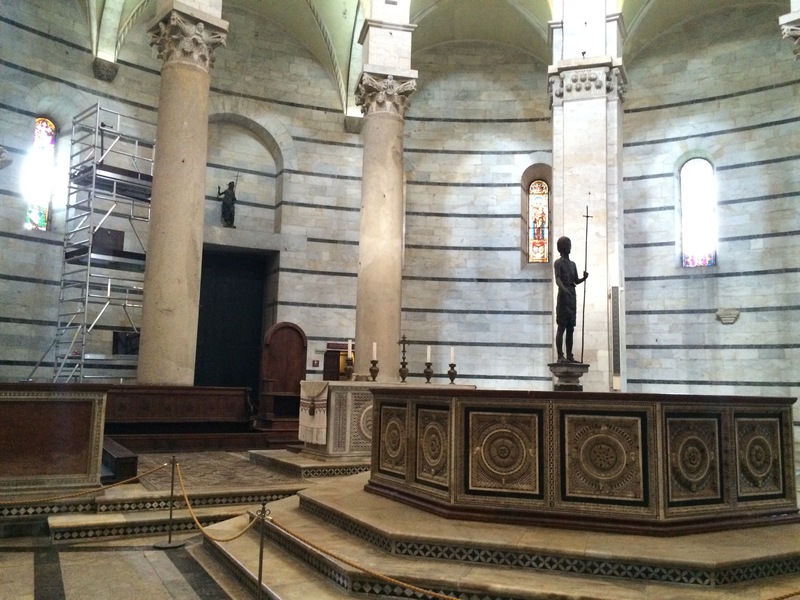 The pulpit and the front altar are all more recent additions. 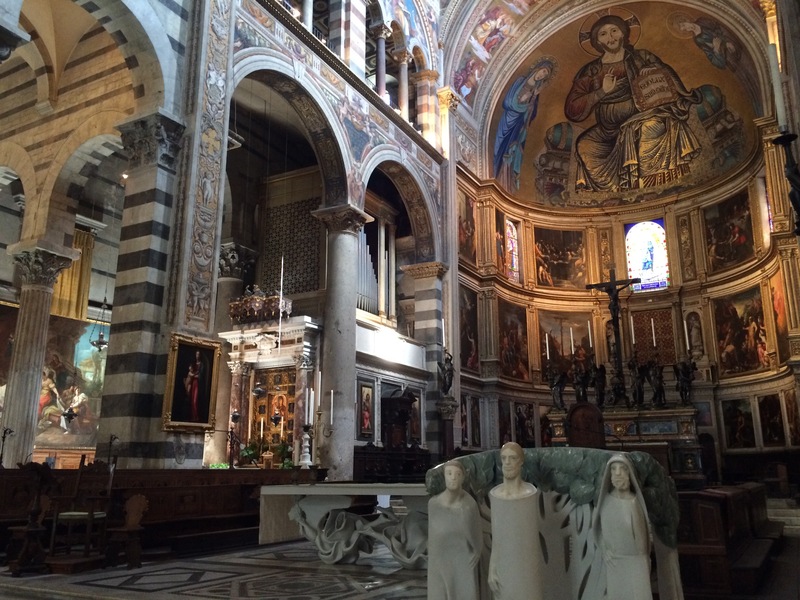 The apse area is flanked by two black marble angels holding large candles. There are several naves around the edges of the main congregational area. 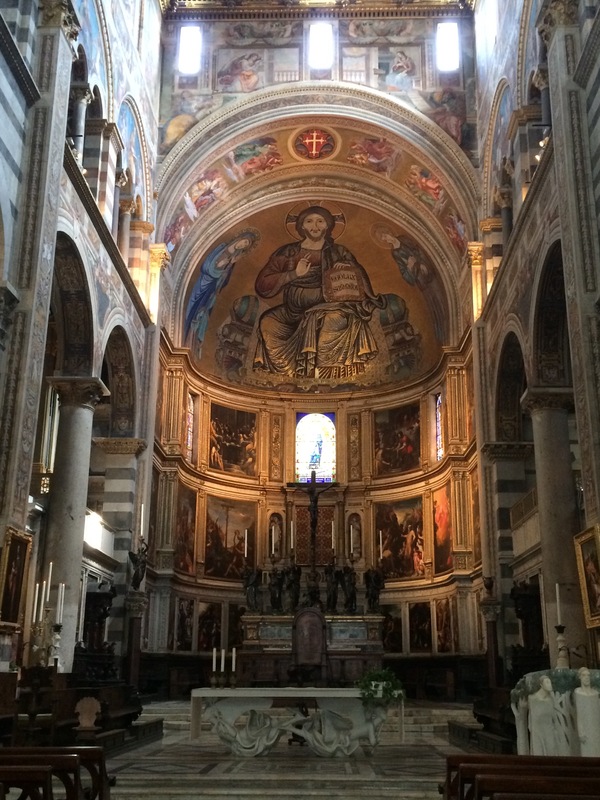 One of which houses the body of Saint Rainerius, the patron saint of Pisa and of travelers. I think I’m going to need to light a candle to him to ensure smooth traveling. I sure do have a lot of future travels planned. 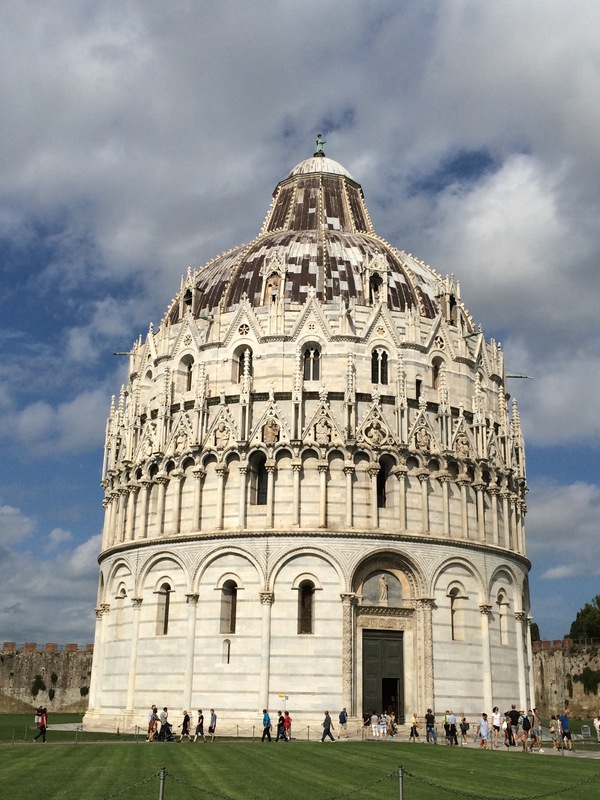 We went back out into the sunshine and were greeted by the sight of what I thought was the most impressive building in the plaza: The Baptistery. It’s a wonderfully round and white building in the 12th century Romanesque style. 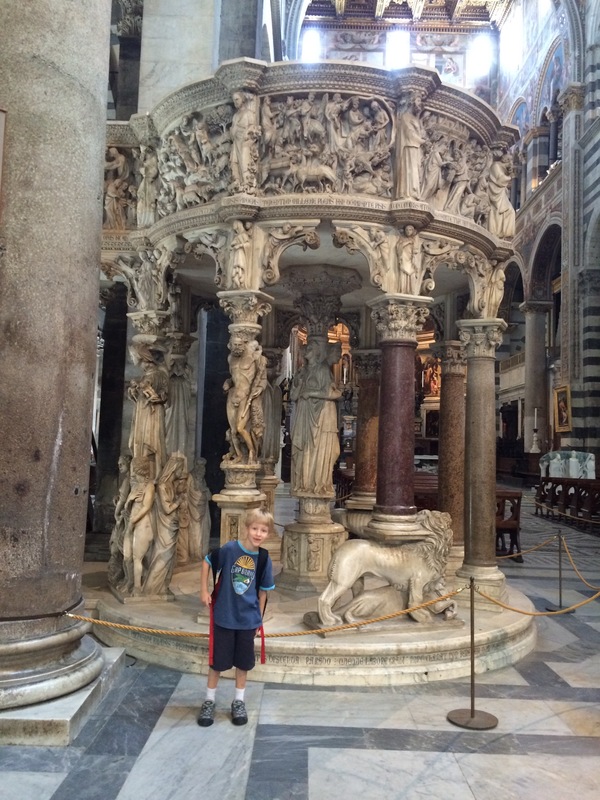 It is dedicated to John the Baptist, with a sculpture of him at the top like a cherry on a sundae. 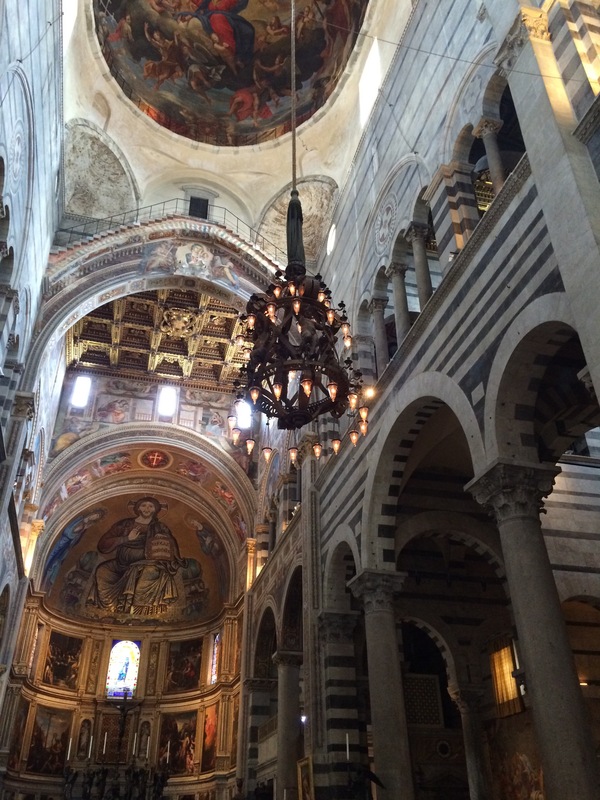 The building was started by one gentleman, but was finished by the Pisano brothers in the 14th century. 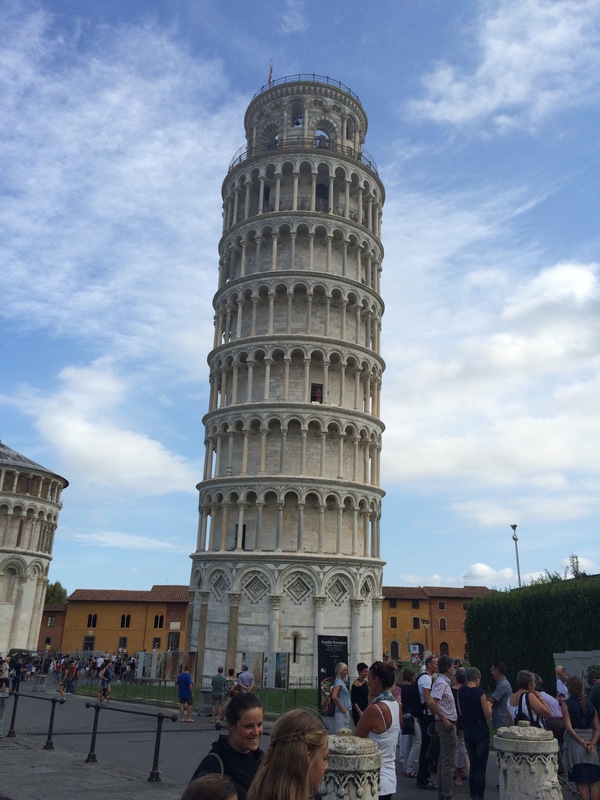 It is actually just a little taller than the Tower of Pisa, but doesn’t seem to have the same tendency to lean as it has less clay in its foundation. The inside feels rather empty even though there is quite a bit in there. The boys were searching for something to do or something interesting to see and ended up finding a staircase going up to the second floor. 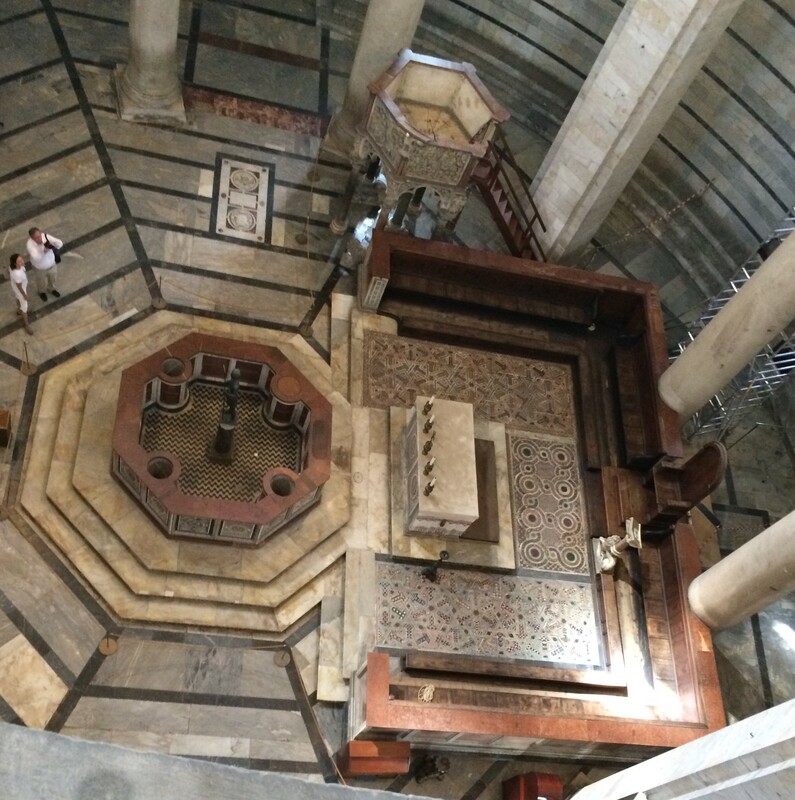 It was a great view and gave me a much better idea of the floor plan and I could see the amazing tile behind the altar and inside the baptismal font. Again, there are very few windows, but there are more here than in the Cathedral. 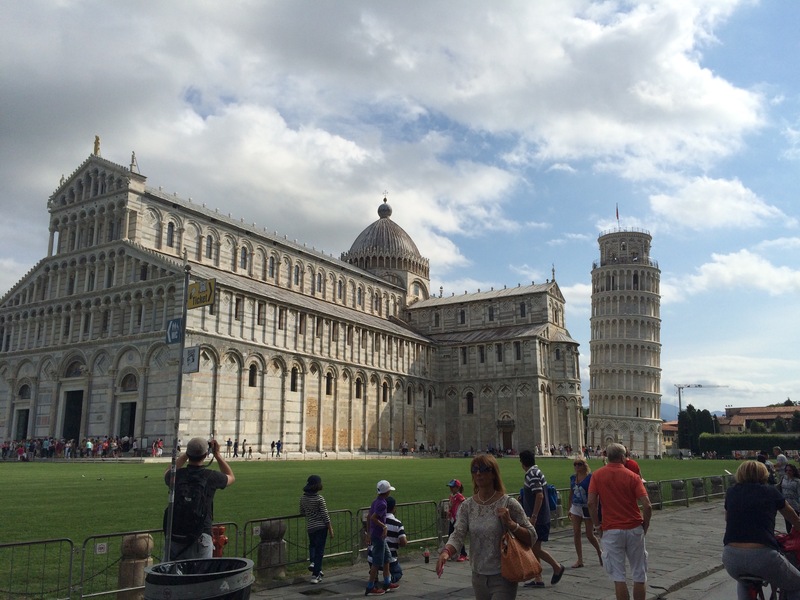 Just at the edge of the Piazza dei Miracoli is the museum. It has some wonderful modern art exhibits. And also these wonderful sketches. These are all the sketch drawings that were under the paintings in the Cathedral. At some point the decision was made to removed the paintings from the wall and hang them on floating panels in front of the wall so if the walls shifted and settled or there was an earthquake the paintings would not be damaged. They were every so carefully lifted and as they did so they found these remarkable sketches underneath. 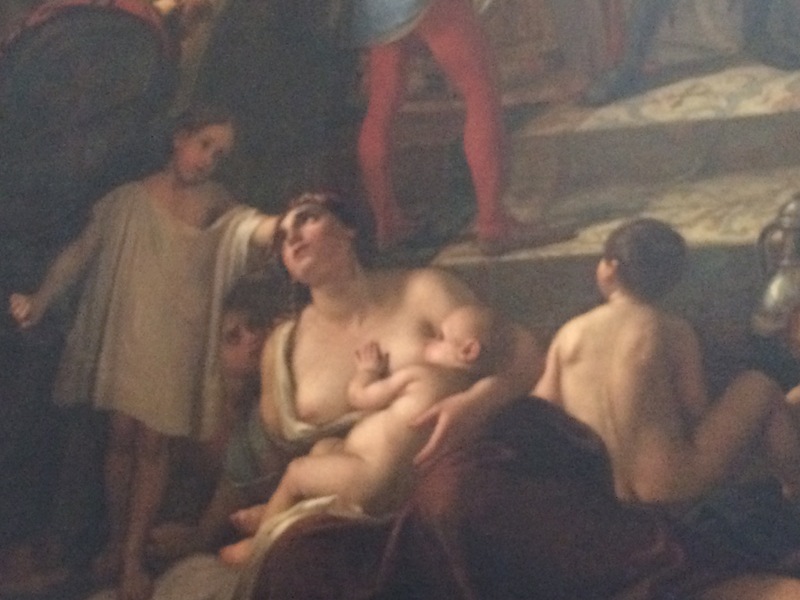 The sketches were removed and conserved and are now on display in the museum. You do actually need to go into the museum because that is where you buy your entrance tickets to the rest of the buildings in the Piazza. So go, pay the extra 3 Euros and see it. The whole Piazza is marvelous to walk around. Vendors are everywhere selling belts, sunglasses, gelato, miniature leaning towers, leaning coffee cups, and other souvenirs. I think the plaza has always been teeming with life. All three buildings were being constructed at roughly the same time, so the main plaza would have been overflowing with builders, masons, artists, horses, food vendors, priests, and gawkers. 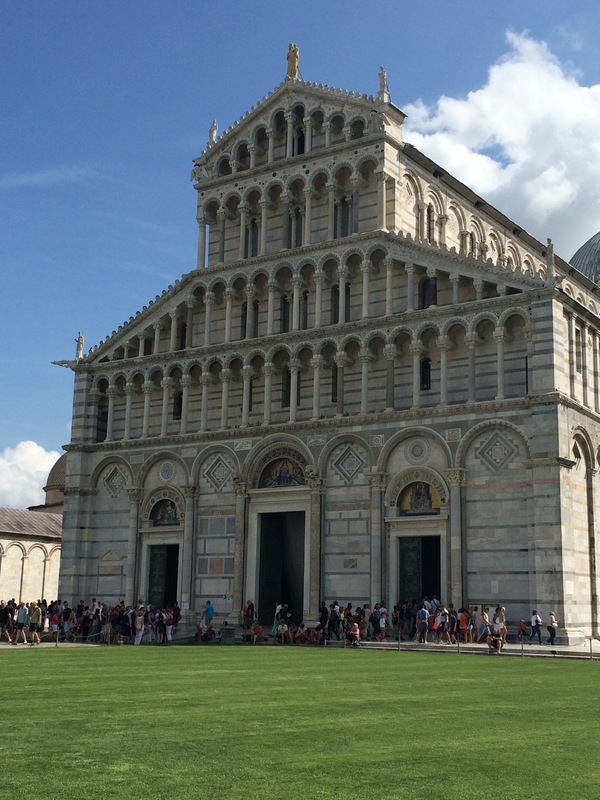 The Piazza dei Miracoli won’t take you an entire day. Well, it could if you really wanted it to, but it is a good half-day excursion not including lunch and a snack at the end. If you are lucky you can see some beautiful brides and handsome grooms getting wedding photos taken. And there is just something wonderful about wandering around the grounds with a cone of gelato. 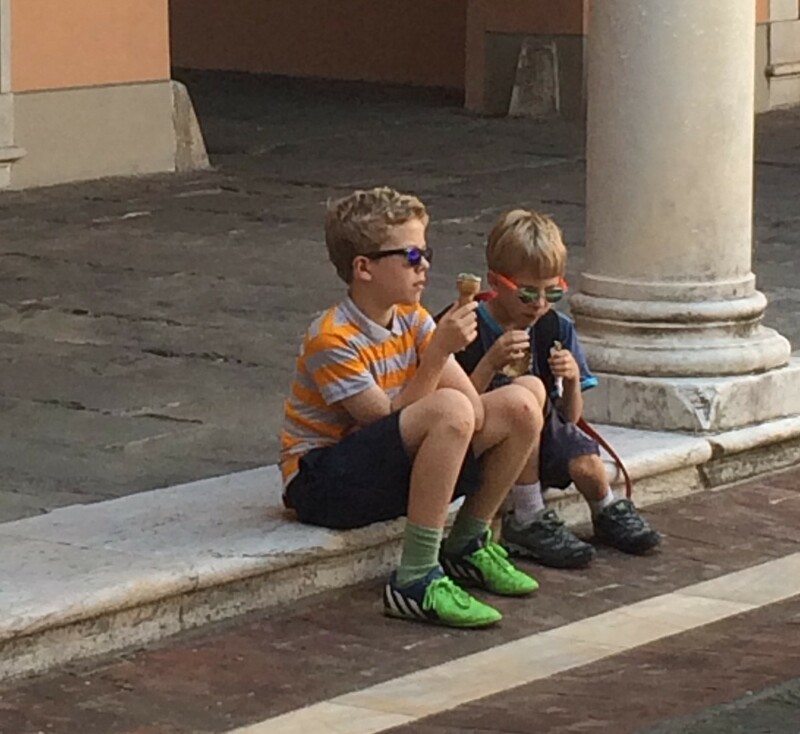 Frankly, the mint chocolate chip gelato was the highlight/goal of the day for the boys. But! To the north are fantastic beaches that line the Mediterranean and we were on our way to explore them next! The Swiss Family Carlson Tans on the Beach!